Friday October 12 at 3:00 p.m.
to Sunday October 14 at 1:00 p.m. The retreat is full - if you are interested we encourage you to join the Wait List. Last year several rooms came available in the weeks leading up to the retreat, and we were able to accommodate 5 from the Wait List. It is also possible that Christ the King will release some extra rooms, but if that happens, it won't be until the week before. Welcoming Prayer is a method of consenting to God’s presence and action in our physical and emotional reactions to events and situations in daily life. Through the practice, we will deepen our relationship with God through consenting in the ordinary activities of our day. Welcoming Prayer contributes to the process of transformation in Christ initiated in Centering Prayer. Our exploration and practice of Welcoming Prayer will include five sessions led by Mary Dwyer, personal reflection time, group Centering Prayer, and wisdom circle sharing. Silence will be observed from Friday evening at 8:00 until Sunday lunch. 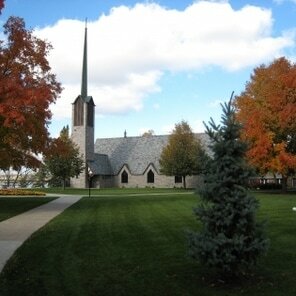 We will be upheld in our journey by the restful quiet and beauty of Christ the King Retreat Center in Buffalo, MN. we can make in each moment of each day. of all that is in ourselves and in the world. Mary Dwyer is a long-time student of Father Thomas Keating and has been practicing Centering Prayer for almost thirty years. In the early 1990’s, she lived at Chrysalis House, a contemplative live-in community blessed by Fr. Thomas. This experience proved to her that a life of prayer, consent and practice is the real work of life. Mary now devotes her time to giving retreats and workshops on behalf of Contemplative Outreach throughout the US and internationally. Welcoming Prayer is the practice that actively lets go of thoughts and feelings that support the false-self system. It embraces painful emotions experienced in the body rather than avoiding them or trying to suppress them. It does not embrace the suffering as such but the presence of the Holy Spirit in the particular pain, whether physical, emotional, or mental. Thus, it is the full acceptance of the content of the present moment. [In] giving the experience over to the Holy Spirit, the false-self system is gradually undermined and the true self liberated.